This post is sponsored by Jovial Foods, organic einkorn, gluten, and allergen free foods. For 10% off your entire order at jovialfoods.com, use coupon code HUMBLEK17. Offer valid until June 1, 2017! My favorite morning pastry is a rich and buttery scone. What pleases me most is that they’re lightly sweetened. A couple tablespoons of your favorite sweetener is all that is needed for a batch of scones. It’s the rich butterfat that lends to its sweetness. Oh yes, a good scone is filled with good nourishing fat. As I’ve been working on healing my gut, I’ve realized that I haven’t been eating as much fat in my diet as I should be, especially for maintaining hormonal balance. If you’re new to this blog, our bodies need saturated fats. As I explained in my post, Is Saturated Fat Healthy, fat is an important part of our body makeup. Our brain and hormones rely on fat to function. Digestion is impossible without fats. An interesting fact I learned from Jennifer McLagan’s book titled, Fat, is that fat and protein are found together in nature because our bodies need the fat to help us digest the protein, so it makes sense to eat a well-marbled steak or even chicken with its skin. Fat also helps the body to absorb nutrients, calcium, and the fat-soluble vitamins A, D, E, and K. These are all benefits of eating real butter, ghee, raw milk and cream, pork lard, beef tallow, and fatty meats. With good quality, pastured butter in hand and nourishing ancient grains, like einkorn from Jovial, homemade scones can be a healthy start to your day. When a grain sprouts, its amino acids, minerals, Vitamin A, and B vitamins increase, while starch and phytic acid decreases. The sprouting process increases enzymes and the digestibility of the protein and starch are improved. In fact, nutrients in sprouted grains are more readily absorbed by the body after sprouting. Scones taste best fresh from the oven and they’re simple enough to make in the morning for breakfast. You simply start by mixing together flour, baking powder, and salt in a large mixing bowl. Cut in butter using your fingers or a pastry cutter until the flour mixture becomes coarse with large pieces remaining. You’ll then want to set the bowl aside in the refrigerator to keep cold. In a separate bowl, you’ll then whisk together an egg, milk kefir or cream, lemon zest, lemon juice, and honey. Once mixed together, you’ll add the wet mixture to the flour mixture and finish by mixing in fresh blueberries. Once mixed together, you’ll set the bowl aside in the refrigerator for 10 minutes to allow the flour to absorb the fat. cut and divide into 8 equal pieces before transferring to a parchment lined baking sheet and baking. Simple, nourishing, and so yummy! 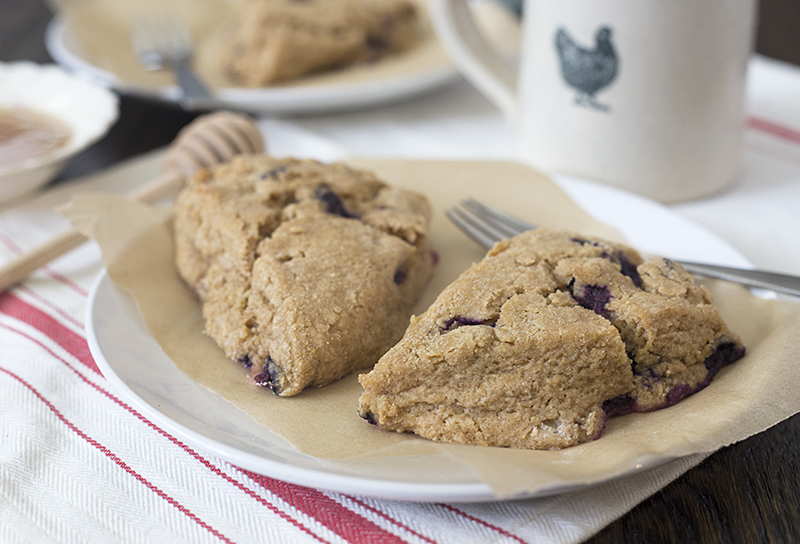 Sprouted einkorn, blueberry lemon scones are lightly sweetened with honey and enriched with butter, blueberries, and lemons that makes this pastry a delightful and nourishing breakfast. In a large bowl, mix together flour, baking powder, and salt. Using your fingers or pastry cutter, cut in butter until the flour mixtures becomes coarse with large pieces remaining. Set the bowl aside in the refrigerator. In a separate bowl, whisk together the egg, lemon zest, lemon juice, kefir, and honey. Pour the wet mixture into the flour mixture and quickly stir together, finishing by mixing in the blueberries. Once mixed, set the bowl aside in the refrigerator for 10 minutes to allow the flour to absorb the fat. After 10 minutes, place the dough onto a floured surface and with flour hands, quickly gather the dough into a ball. Don't over-knead. Flatten the dough until it is about 1" thick and cut into 8 equal pieces. Transfer the pieces to a parchment lined baking sheet and brush the tops of the scones with kefir. Bake at 350F for 25 to 30 minutes or until lightly browned on top. Drizzle the scones with honey before serving. Hey, friends! Jovial Foods would like to give My Humble Kitchen readers a coupon code to their online store! By using the coupon code HUMBLEK17, you can get 10% off your entire order! (Excluding Cookbook, gift baskets, gift cards. Can not be combined with other offers.) This offer is valid until June 1, 2017! What are you waiting for, pick up a package of their einkorn sprouted flour today! Have you made scones for breakfast? What are your favorite flavored scones? I tried the coupon code and it didn’t work. (I copied and pasted it). Andrea, I’ll check to see what’s going on! Thanks for letting me know. We got it figured out, It’s HUMBLEK17. Sorry about the confusion. I also tried the coupon and it did not work. Sally, I apologize. It’s HUMBLEK17. Thanks! Hi I am healing from diverticulitis and so am on a low fiber diet for the next week or so. In my reading, it says that dairy and animal products are hard to digest. So I am a little confused when you say you are trying to heal your gut yet encourage the use of animal products. Help me understand!! Hi Susan, thanks for asking these great questions. Yes, if you’re healing your gut, it’s definitely good to do an elimination diet especially of dairy products. Good nourishing fats for healing could be coconut oil, avocado’s, and ghee. As far as those that aren’t in healing mode, animal products filled in good fat and raw dairy can be easier on the digestion. However, each individual is different. Myself, I don’t do well with pasteurized dairy of any kind. So I drink mostly coconut milk and starting next week, we’re getting raw milk once again! Yay!! 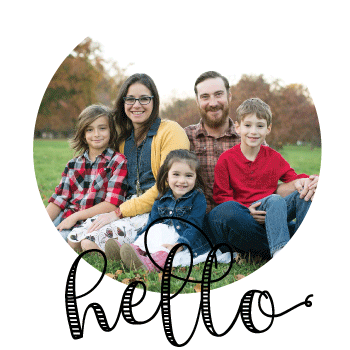 I’m not sure if you’ve heard of Aviva Romm but she has a great elimination diet that has helped many people restore gut health. You can check out her work at avivaromm.com. Also, if I were dealing with diverticulitis, I’d most likely start the GAPS diet for complete healing. I hope that was a little helpful! With gut problems, you’ll probably want to stay away from wheat and grains too. Blessings on your healing journey!! I wouldn’t substitute 1:1 coconut flour in this recipe as it will not work out. I believe Jovial has a gluten-free flour that you can sub 1:1. I’d start there! These look incredible! Is making them with frozen blueberries an option? I’m guessing I might need to thaw them and remove the excess moisture before using. Yes, Kaelynn, you can definitely use frozen blueberries. Your dough will turn blue, but it shouldn’t be a big deal! Mix them in quickly. Thanks! I’m planning to make them tonight 🙂 Also, I used your Jovial Coupon–thank you so much! I’m so grateful that I discovered Jovial through your blog. My mom is struggling with gluten intolerance, but she can eat Einkorn with no trouble. I know she will be excited for these scones! I just had to return to say that these scones were the best I’ve ever had or made. I’ve never had any luck making scones before, and I’m still getting used to working with Einkorn, so success with these made me feel incredible! I’ve made them twice so far! The first time I made them, I forgot to add the blueberries until after the dough sat in the fridge for 10 minutes, and I actually found it was much easier to mix them in that way. I used frozen wild blueberries from Trader Joes and the end product was delicious and not even very purple–not that it matters! They’re delicious! Thank you a thousand times! I so love reading your posts and learning from you. Thanks for sharing with us all. I am anxious to learn how to make a simple sourdough bread. Any thoughts to share on that? I have purchased the Vintage Bread Book and am enjoying reading it. I am also a Mama diving into the CM philosophy with my two little guys. It is a life giving approach to educating and more importantly to life. Will you be at LER this summer? I would love to have a chance to chat with you. Hi, Sally! I’m so saddened, but I won’t be able to attend this year:( I do plan on attending the CM day long seminar in Des Moines this May! Have you heard of that? I’ll have to spread the news!! As far as sourdough, I’m working on an einkorn sourdough starter. Since it’s the flour I use in my kitchen, I’m going that route. I’m using Jovial’s cookbook, Einkorn. It’s a great resource!! Not easy to find Einkorn flour here. So is buckwheat flour. i am on a migraine elimination diet and cannot have lemon/lemon juice ? If I eliminate it would that be ok or do I need to add another liquid? If so any non citrus recommendation? Thanks. If you eliminate it, that will be totally ok.